The OKCU Reads program, which has become a highlight of new student orientation, requires all incoming first-year students to read a common book before arriving on campus for fall classes and to participate in discussion groups and attend a talk given by the author. "The grandchild of a former landlord–China’s most spat-upon class after the Revolution–Chen was regularly beaten to a pulp by other children and, despite performing at the top of his class, repeatedly denied the right to continue at school. "His family of nine–including his brother, three sisters, grandparents and parents–subsisted on moldy yams alone for entire winters. Meanwhile, his grandfather was attacked randomly by neighbors and forced by the local authorities to guard lumber and tend fields. Chen’s father, with his prerevolutionary college education, eventually managed to extract himself from the labor camps by becoming skilled in acupuncture (he used the biggest needles on the hated "cadres"). "At the climax of this survival story, Chen, the book’s first-person narrator, and his older brother, Jin, both compete in China’s first nationwide, open educational tests in 1977: 'We were out to make a point. The Chen family had been dragged through the mud for the last forty years…. Now it was time.' Scoring among the top 2% of the country, the 14-year-old Chen achieved his dream of attending Beijing Language Institute. Da Chen grew up in the deep south of China, running barefoot in muddy fields and riding the backs of water buffaloes. In his tiny Fujian village, water was fetched from an ancient well swimming with snakes, and the only lights that burned in most households were hissing kerosene lanterns. As the grandson of a disgraced landowner, he was a victim of communist political persecution and hollowing poverty during the Cultural Revolution. His family was beaten, his father thrown in reform camp, and young Chen, at the age of nine, was threatened with imprisonment. Unfailing family love helped him survive in a dysfunctional society and he found unexpected love and friendship with four other hoodlum outcasts, but dreams made him soar above the poverty and persecution. His first encounter with a Christian woman, a Baptist professor, was life-changing. She taught him English and opened the possibility of another world. He excelled in college at Beijing Languages and Culture University, and stayed on as a professor of English after graduating top in his class. The Spring Honors Colloquium class developed presentations as supplemental materials to the OCU Reads book. 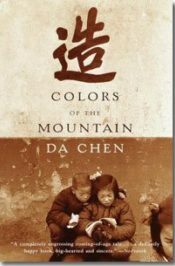 The OKCU library recently completed and posted a research guide for the new OKCU Reads selection, Da Chen’s Colors of the Mountain. It includes a link to an electronic copy of the book, reviews, electronic books and articles on related subjects and some subject ideas related to the memoir. You can find a link to the research guide on the library's website.